This Easy Spicy Pork Tenderloin Recipe with Cranberry Jalapeño Compote will knock your valentines socks off. Tender, Juicy and a touch of heat equals perfection! This is super easy to make and it’s sure to wow your Valentine. They will never know that you had dinner on the table in 30 minuets or less. I served mine with a Cranberry Brussels sprout salad it was the perfect complement to the dish. Preheat oven to 400*. Spray a casserole dish with a bit of non-stick cooking spray. Grate the lime zest from 3 of the limes; then juice the lime and place the juice in a separate bowl. Mix half of the lime zest in a bowl with the salt and pepper. Place the tenderloins into the casserole dish fat side up; rub the tenderloin with half of the lime/salt mixture. 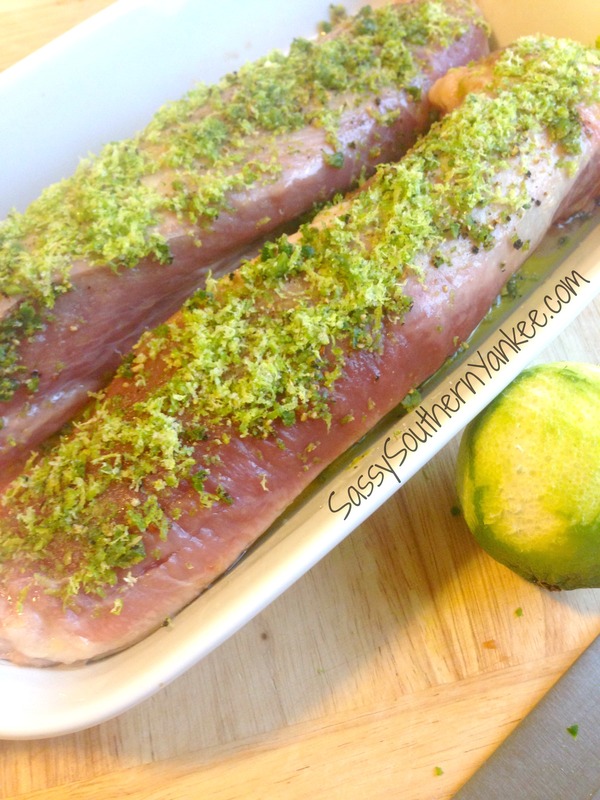 Roast in the oven for 10 minuets then flip the tenderloins over and coat with the remaining lime/salt mixture. Continue roasting until the internal temperature reaches between 145* and 160*, about 25 minuets. 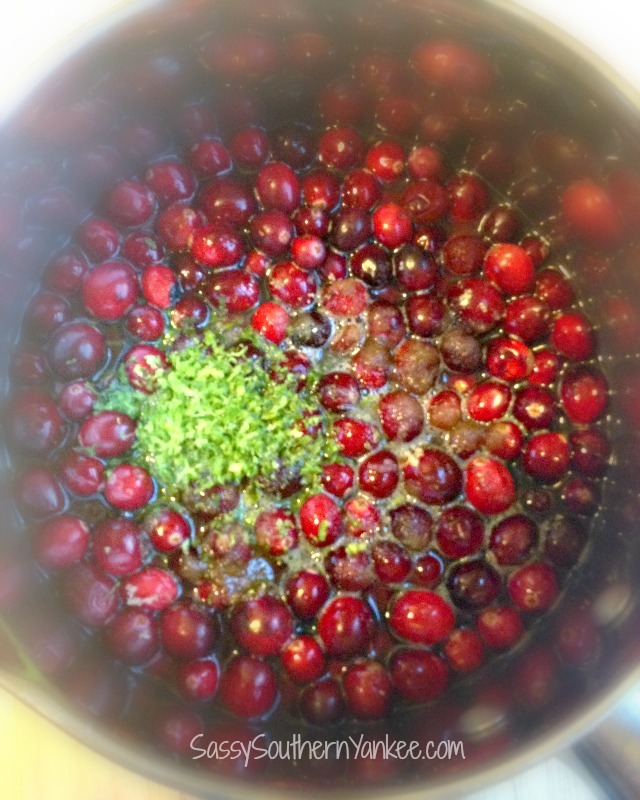 While the pork is roasting make the Cranberry Jalapeño Compote. It’s super easy to make and will make your taste buds jump! It’s so yummy its a little sweet, sour, and has a bit of heat. To get started! In a medium saucepan mix the cranberries, water, brown sugar, zest of one lime and juice from all of the limes. I add the whole finely diced Jalapeño; however you might want to start off with half until you know how spicy you want the compote. Bring to a boil over medium heat. Reduce heat to medium and simmer sitting occasionally. The berries with burst and the sauce will thicken after about 5 minuets. I cover the saucepan between stirring because the cranberries bursting can make your stove a bit of a mess. Once the spicy pork tenderloin is cooked allow it to rest on a carving board for 5 minuets prior to carving. This allows the juices to redistribute creating a more juicy piece of meat. Carve the pork and serve with the sauce. This Easy Spicy Pork Tenderloin Recipe with Cranberry Jalapeño Compote will knock your valentines socks off. Tender, Juicy and a touch of heat equals perfection! This is super easy to make and it's sure to wow your Valentine. While the pork is roasting make the Cranberry Jalapeño Compote. It's super easy to make and will make your taste buds jump! It's so yummy its a little sweet, sour, and has a bit of heat. 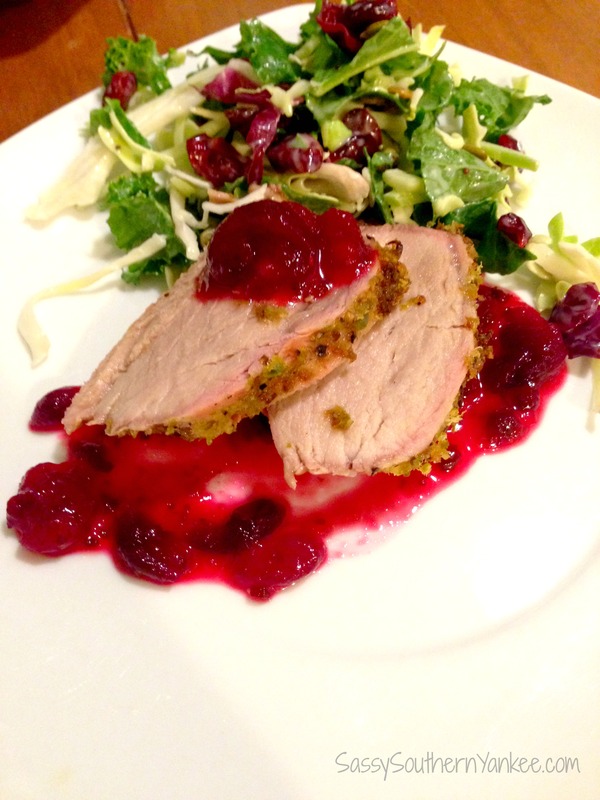 This entry was posted in Main Course and tagged Baked Pork Tenderlion, Cranberry, Easy Dinners, Easy Meals, Easy Roasted Pork Tenderloin with Cranberry Jalapeño Compote, Healthy Meals, jalapeño, Pork, Pork Tenderloin, Pork Tenderloin Recipe, Spicy, Spicy Pork Tenderloin, Tenderloin, Valentine's Day, Valentine's Meals.